We are being promised a very serious blizzard-like snowstorm within the next 24 hours and aside from the typical necessities like water, bread, eggs and milk, I made certain to stock up on several ingredients for most essential hot chocolate. No pun intended here. Because what is better after a few hours of hard shoveling work then a nice warm chocolaty beverage, am I right? And now I feel well prepared to get stuck inside for the next few days, if need be. The grand news for all of you is I have not one, but two spectacular hot chocolate recipes today to keep you nice and cozy this winter. On top of that, this weeks Youtube video installment walks you through the raspberry white chocolate version in perfect detail. Feel free to watch that here if you'd like or read till the end of the post where it will be inserted as usual. And now for my recipes. 1. Heat the milk and milk chocolate chips in a medium sized pot over medium-high heat on the stove top for 5 minutes, stirring constantly as the chocolate melts down. Once the milk has come to a boil, reduce the heat to low. 2. Grind 10 oreos up very finely, using a food processor or by hand. Then add the ground up oreos to the warm milk and chocolate mixture in the pot. Allow that to cook up and come together for one more minute. Then add the splash of peppermint extract and stir it in before removing the pot from the heat. 3. 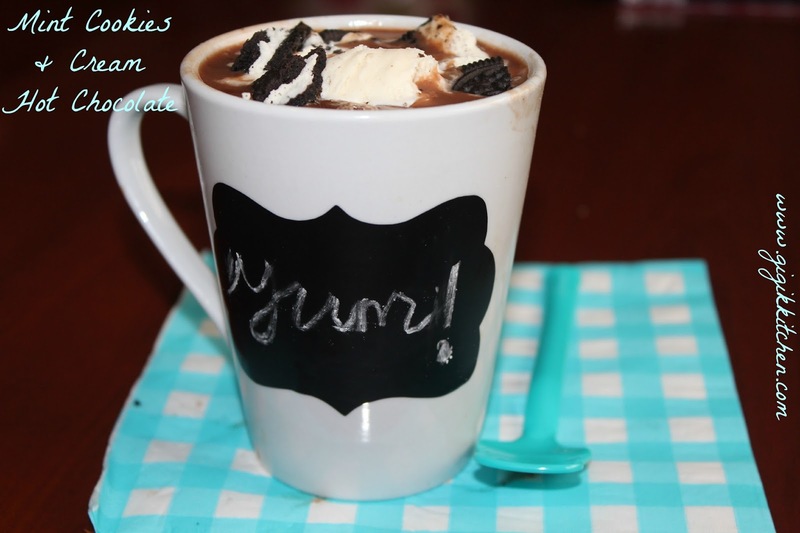 Pour the hot chocolate into mugs and add 2 scoops of vanilla flavored ice cream. Crush up 1 more oreo and sprinkle the pieces over the top. Serve immediately. How adorable are these chalkboard stickers? I discovered them in the dollar bins at CVS a couple of weeks ago and have been finding loads of awesome uses for them ever since! It's such an easy way to to turn a plain container, mug or really any old thing into something exciting and new. 1. Place the two cups of milk, baking chips and defrosted raspberries in a pot and stir over medium-high heat on the stove top for about 10 minutes or until the chocolate has melted down and the raspberries have broken up and fallen apart. Stir constantly as it cooks. 2. Once it has all come together, put the entire mixture through a blender and blend for 2-3 minutes until the mixture is completely smoothed out. 3. Reheat the hot chocolate mixture if it has cooled off at all during the time it was transferred to the blender and blended. 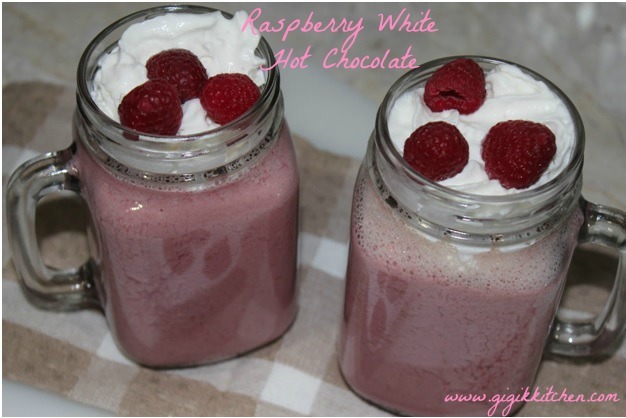 Pour it into your cups and top each one with a generous amount of whipped cream and some fresh raspberries as well. Shave some white chocolate over it all if you'd like as well. Both of these drinks will certainly be prepared in my home several times before this long winter finally leaves us. Try them for yourself, they are sure to become staples for you as well! If you do give them an attempt, please do share your pictures and feedback on my facebook page or by tagging me on instagram, I truly do love getting to see them! Look out for more cold weather appropriate recipes coming very soon as well, I've been incredibly busy in the kitchen lately.